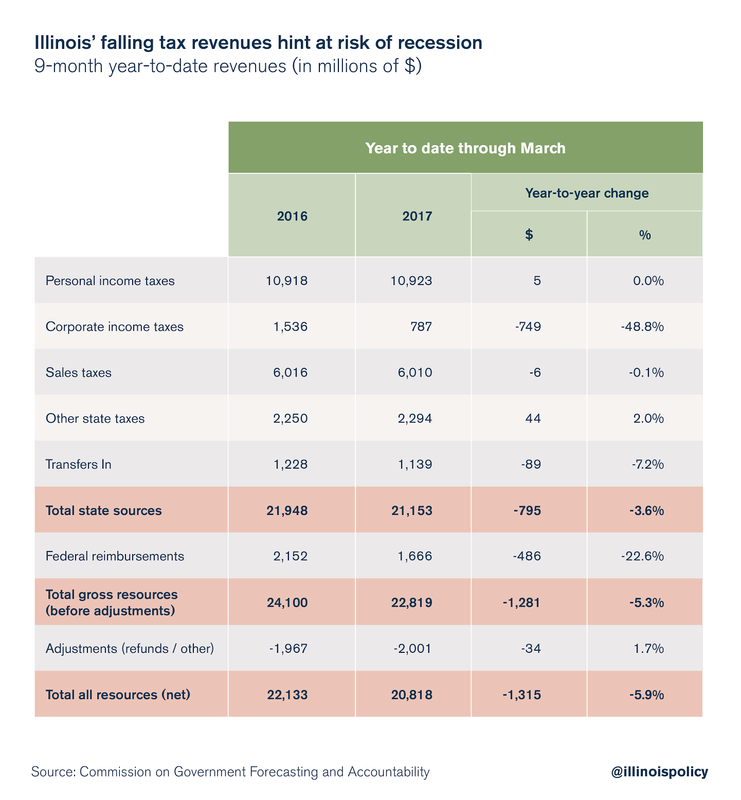 The latest report from the Commission on Government Forecasting and Accountability shows Illinois experienced falling tax collections, indicating trouble in the state economy. Spending reforms – not tax hikes – are what Illinois needs to right its fiscal ship and boost economic growth. Based on one measure of economic health – how much a state collects in tax revenues – it appears Illinois is flirting with a recession. Illinois’ drop in state tax revenues compared to 2016 is driven in part by slow business activity, a weak job market, stagnant incomes and fewer taxpayers. Illinois’ economy and the people who depend on it are struggling despite a booming stock market and a national economy that has finally gained traction. Despite those struggles, Illinois politicians continue to promote multibillion-dollar tax hikes in lieu of meaningful spending reforms and pro-growth policies as a solution to the state budget crisis. Tax hikes would put even more strain on taxpayers and businesses. Some Illinois residents and employers already are operating under recessionary conditions. According to a recent Moody’s Analytics report, four of Illinois’ metro areas in Illinois are already in a recession and four more are on the verge of one. Moody’s measures a metro area’s health based on its manufacturing activity, housing starts, house prices and employment rates. The state’s falling tax collections reflect their findings. According to the latest report from the Commission on Government Forecasting and Accountability, or COGFA, shows Illinois state government’s revenue collections are $1.3 billion down, or almost 6 percent, from this time in 2016. While the state collected $22.1 billion through this time last year, it has only taken in $20.8 billion year-to-date in fiscal year 2017. Stagnant personal income and sales tax collections is bad news for Illinoisans. Illinois’ economy isn’t showing the same signs of growth as other parts of the nation. 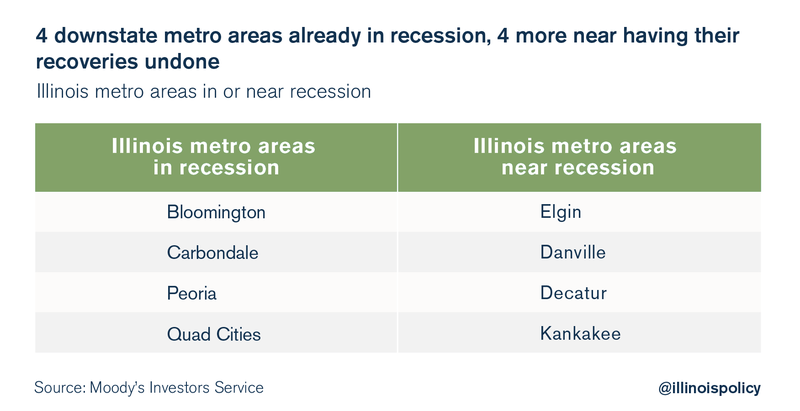 In fact, no metro area in Illinois has entered the expansion phase of the business cycle, according to Moody’s. Illinois is the only state in the region to have that poor distinction. Even more concerning is the $749 million, or 49 percent, drop in corporate income tax revenues. To make things worse, federal funds from Washington, D.C., also fell $486 million, or almost 23 percent compared to this time last year. These struggling communities – and the state’s economy as a whole ­– aren’t helped by the fact that Illinois is losing part of its tax base to other states. Illinois has lost, on net, more than 1.2 million residents between 2000 and 2015, and those former residents have taken more than $40 billion in taxable income with them. Illinois’ total population has shrunk for three years in a row. According to a recent poll by the Paul Simon Public Policy Institute, this trend may continue. Of the Illinois registered voters polled, 47 percent said they want to leave Illinois. Respondents cited taxes as the single biggest reason they wanted to leave. Another poll, commissioned by the Illinois Policy Institute and conducted by Fabrizio, Lee & Associates, found that 60 percent of respondents said state taxes are already too high. A full 70 percent said their property taxes in particular were too high. And nearly 80 percent of those polled agreed that “Illinois state lawmakers should pass major structural reforms before passing any tax increase” to resolve the state’s budget deficit. These poll numbers make any state budget negotiation centered around a multibillion-dollar tax hike absurd. A tax increase won’t help to boost the economy or stop Illinoisans from moving. In fact, it would drag down the economy even further and push more taxpayers to move to other states. Instead of debating how much to tax and the different ways to do it, the General Assembly should focus on policies that reform how it spends money. A good start is the plan put forth by state Sens. Kyle McCarter, R-Lebanon, and Dan McConchie, R-Hawthorn Woods, called the “Taxpayer Bargain,” which balances the budget without any tax hikes. Much of the senators’ plan feeds off of the reforms already laid out in the Illinois Policy Institute’s Budget Solutions 2018. The Institute lays the groundwork for real government spending reform through a property tax freeze, while empowering local governments to control their costs. It also spells out true pension reform that protects state employees’ retirements while reducing the cost to taxpayers. Illinois needs policies that keep its people here and draw residents and businesses in from other states. Tax hikes won’t do that.